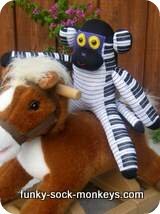 Fun sock monkeys and sock animals to hug. 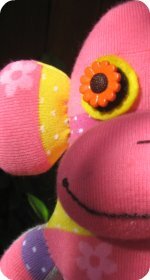 Where to buy sock toys - sock pal rabbits, mice, fish, cats, frogs, cows and monkeys - of course! Paul Frank Julius monkeys and monkeys by Schylling Toys are great. Paul Frank puts a fun spin on the classic looking sock monkey doll, with Julius monkey dolls made with monkey face fabric in pink and blue. Schylling Toys have some cute traditional looking sock monkeys and some mini baby sock monkey that stand just over 7" tall. 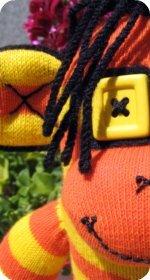 Sock Pal toys - sock cows, sock frogs, sock rabbits, and sock monkeys all handcrafted from real socks so pets can have as much fun with their sock toys as we do with ours. 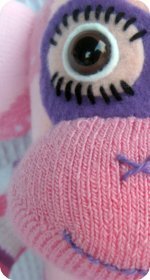 Learn how to make sock toys with free patterns and instructions for sock monkeys and sock elephants. 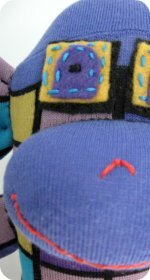 You can make your own handmade sock toy from Rockford red heel socks or any other socks (you just need two). 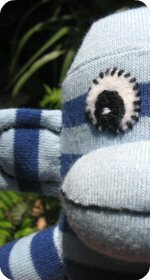 It is a fun sewing project for older kids, and a great craft project for adults when we are wanting to create a unique homemade toy for our loved ones. If you are looking to find sock monkeys, Paul Frank has a collection of Julius Monkey toys and character heads. 15" Paul Frank Devil Julius made in soft polar fleece fabric Julius.